President Packard, members of the Brookline Historical Society, ladies and gentlemen: This is a distinguished group of Brookline citizens, assembled here in this lovely old room, whom I have been given the honor of addressing today on the age-old subject of fire and the resultant effects it has had on the history of Brookline. Before I proceed further, kindly allow me to pass around these rare old pictures of horse-drawn fire apparatus and of this hand-drawn hose reel for your perusal. At this time I should like to present to the Society on behalf of the Chief of the Brookline Fire Department, George L. Gettings, this memento of the recent fire at the First Presbyterian Church. This stalagmitic-shaped piece of lead has been presumably formed in this unusual shape by the heat of the fire melting the lead weights of the famous old clock in the church steeple and by the molten lead falling about ninety feet into the basement area and then being suddenly cooled by the water falling from the hose streams which were played into the burning steeple. Several of these stalagmitic forms of lead were found by me in the basement ruins several days after the fire. These formations remind one of the stalagmites found in the floor areas of limestone caves situated throughout several areas in the world. The first mention of unfriendly fire, that is fire out of control, in the historical records of Brookline, appears in Samuel Sewall's diary in 1688, which reads: "Three Indian children being left alone in a wigwam at Muddy River, the wigwam fell on fire and burned them so that they died." This is notable as one of the first fire fatalities recorded in the New England area if not in North America. A few years later, in 1691, we learn again through the records kept by Samuel Sewall, of the house of Joshua Gardner and his wife, whose maiden name was Mary Weld, being consumed by fire on Sunday night, January 11, of that year. Two of the Gardner children perished in the flames. The house was located in the vicinity of what is now Walnut Street near Kennard Road and not too far distant from the church in that area. Here again we note a second case of children losing their lives by fire. Let us imagine that we are living during these times and let us try to realize how serious a situation we would be confronted with if we experienced the loss of our home due to a fire, particularly in the winter time. Think of the situation to be faced, physically and economically. There was no such thing as the Salvation Army or the Red Cross, hotels, stores, or even next-door neighbors. There were no canned foods or other physical comforts available. All articles of clothing had to be made by hand, by the spinning and weaving processes. The fabrication and sewing was accomplished in poorly lighted and crowded quarters during time allotted from many other tedious household tasks to which the people of today never give a moment's consideration, with the modern services and appliances available to do this work. Lumber had to be cut by hand. There were no nails, ready milled lumber or other available building materials with which a new structure could be quickly erected in an emergency. Food could not be stored in great abundance because modern methods of preservation were unknown to these early pioneers. Each family set aside for its own use during the winter months such staples as could be stored by salting or by dry storing and would keep for human consumption. Houses were not built with large and spacious rooms, due to heating problems and limited building supplies. Therefore, when one suffered a fire, one lost all one's food, clothing, shelter and, in many cases, the livestock in adjoining barns or sheds. We can perceive the difficulty involved when one fire-stricken family was forced to move in with a neighboring family until a new house could be constructed after a serious building fire. We can readily surmise from the historical records that these early settlers shared each other's sorrows and misfortunes with mutual understanding and charity for one another, having experienced the environmental hardships inflicted upon them by nature and with a limited knowledge of the sciences such as have been developed since that time. We can only admire the strong character of their personalities and their fortitude which has been demonstrated in their struggle for survival. Fire, to these people, was a much more dangerous threat to their very existence than it is to us in this modern day because we have the physical, scientific and economic means to control and rebuild. Fire today has the same danger potential as of yesterday, but in the light of modern living we are inclined to be much more careless about fire than our forefathers were, due to our modern fire-resistant construction and protective devices. 1721 was an explosive year in Brookline. Smallpox was a scourge that swept uncontrolled throughout the world taking many lives and disfiguring countless people. Dr. Cotton Mather had been made acquainted with a method of inoculation against the disease, which at the time had been successfully practiced in Turkey and was then introduced into this country. The well-known Boston Minister influenced Brookline's Dr. Zabdiel Boylston to advocate the new idea of inoculation here in this town. The introduction of this new practice precipitated a violent issue of debate among the influential citizens of Boston and surrounding localities. Benjamin Franklin, aroused in bitter anger, condemned this "murderous policy". Dr. Boylston was forced to go into hiding for two weeks after being threatened with hanging. A bomb was tossed into the bedroom of Cotton Mather in his Boston home at 3:00 A.M. on Tuesday, November 13, 1721, but the fuse was knocked off the bomb and it did not explode. This we note as the first bombing incident recorded in the Boston area in an outbreak of civil violence. Today we read of so many bomb threats and actual incidents that we are almost calloused in our mental attitude relative to the subject. "Last Monday, A.M., April 14, 1740, the house of Nathaniel Gardner of Brookline; next to the meeting house in that Town took fire and was burned down, but most of the household goods saved. It was occasioned by a chimney's being on fire, the sparks falling on the roof catched the shingles, which being very dry burnt so violently, as 'twas impossible to put a stop thereto." The road to Brighton which connected with the "Old Sherburn Road", was laid out prior to 1725, and is probably along the same route as what is now called Chestnut Hill Avenue. Situated on the East side of the street was a house owned by Isaac Gardner, who inherited the house from his father. The Massachusetts Gazette dated September 8, 1768, tells of the burning of the house with a loss of four to five thousand pounds. The fire occurred on a Friday and made the family of 18 persons homeless. The following Monday, all of Brookline's fifty families met and raised 100 pounds to help Mr. Gardner to rebuild his house. Harriet F. Woods&apos; "Historical Sketches of Brookline", describes a fire in the Punch Bowl Tavern; "Here the Selectmen of the town used to have an annual supper and on one of these occasions the old building came near being destroyed by fire. They had sat round the table smoking, after the repast and probably dropped fire upon the table cloth, which was gathered up and thrust into a closet by a servant. Soon after retiring, the family were awakened by the smell of smoke and flames arising from the closet burst through the chamber overhead, where the landlord's children slept. The frightened children rushed out in their night clothes to the neighbors' houses; the night was bitterly cold and the ground covered with ice and but for the landlord's promptness and presence of mind, the whole establishment would have been speedily reduced to ashes. Without stopping to put on a single garment, just as he sprang from his bed, he gave the alarm and seized a bucket of swill which he dashed upon the burning mass in the closet, closed the doors carefully after him and brought water from the pump, directed the labor of others who came with their buckets and put the fire out and saved the building, though the flames actually reached the attic. There was at this time an engine in the Village kept in a house which stood in what is now the front yard of the Oliver Whyte estate; it was owned by Brookline and Roxbury in common." The records state that Brookline voted to share one half of the expenses of the fire engine with Roxbury in 1795. This fire possibly happened about this time. The report of this fire is historically significant because it records the first record of a known evacuation of a burning building in Brookline and was the forerunner of our lawfully required fire exit drills in effect today in our schools and hospitals and other places of public assembly. 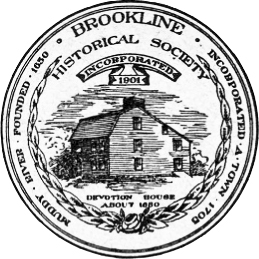 Brookline's first meeting house was erected on November 10, 1714, in the vicinity of Walnut Street near the cemetery. The structure was 48 feet by 35 feet, 2 stories in height, of wood frame construction. A steeple was added in the year 1771. About the year 1802, someone set fire to the church and the fire was discovered in time to limit the damage to one rear corner of the building. The church was later replaced with a larger and more permanent edifice having a steeple measuring 137 feet tall. This was the first recorded arson case and the first mention of a church fire in the town. "One day the week before last Mr. Nat. Griggs went to Boston in the morning with his team and before he got back his House, furniture and Cloaths except what he had on his back were consumed by fire. His house was all finished but one Room. The carpenter had just begun to finish that and went over to Mr. Moses Griggs' to get some tools. It is said he was not gone more than ten minutes and when he came back the House was all in flames,-he left a window open and there was a little fire on the Hearth to smoke Bacon, and it's supposed the wind blew a train of shavings into the fire which caught the house. The Housekeeper was spinning in the kitchen but did not perceive the fire till the flames burst in upon her & she jumpt out a window and lost all her Cloaths but what she had on. But Mrs. Moses Griggs and Mrs. Tom Gardener have been around the town to collect Cloaths for her so I believe her loss is in part made up if not all. . . . . When Mr. Griggs got home and found his House and all that was in it burnt up (except a few things in the cellar were saved) he was ready to sink. One hundred dollars of money was consumed some silver, some Bank Bills, the Silver was melted into small pieces like shot. But one of his Brothers and Ebby Davis went round the next morning with a subscription paper & people were very liberal, the more so because he was a very industrious young man. Judge Dana, of Cambridge gave him eighty dollars, Major Gardener forty, Mr. Mason twenty and every body according to their ability. Some gave him Timber, some boards carried to the spot, some bricks, some lime, and in short he is to have a new house raised this week and expects to be married before long to Nancy Aspinwall. He was finishing his house for her when it was burnt." Along about 1809, Deacon Joshua C. Clark had erected for himself a new house situated on the site of the old Joshua Boylston house on Warren Street near Walnut Street. The house was receiving the interior finishing details when it took fire and burned to the ground, a total loss, which fell upon the carpenter, one Nathaniel Murdock, who had not as yet turned over the completed home to Mr. Clark. Again the townspeople rallied and raised a considerable sum of money to assist the poor carpenter. Mr. Clark married Rebecca Boylston and they took possession of their newly rebuilt home in May, 1810. The Dana Tavern burned in what is now Harvard Square one night in January, 1816. Benjamin Bradley, afterward the owner of "Bradley's Hill", saved the lives of a woman and child by mounting a long ladder and taking them from an upper window. This is the first recorded rescue by means of a ladder used at a fire in Brookline. The first engine house was situated between Walnut Street and "Village Lane". The building was ten feet by fifteen feet in size. Later it was moved to a lot between Walnut and Boylston streets, which is now occupied by a gasoline service station. The building was located at this spot in 1820 and for some indefinite time thereafter until partially destroyed by a falling tree. During this period, some of Punch Bowl Village was located in Roxbury and the engine was owned by both towns. The fire company was manned by 15 men residing in both towns. The members took turns at officiating as "Captain". Upon the election of a new Captain, it was customary for that individual to be host to his men by serving a supper to the fire company at his own home or at the "Punch Bowl". Social and festive events were an important influence in keeping the volunteers together as a company and it is quite possible that some of these affairs could have been the most stimulating source of enjoyment to these men who sought excitement or social recognition in their time. This incident is important historically because it may be the first recorded (or the first time) that mutual aid in firefighting did occur in America. Mutual aid in modern times (1961) is the pre-planned action of fire departments of neighboring municipalities to assist one another by following a pre-determined course of action which is initiated by a pre-determined code of fire alarm signals which are interconnected with all the cities and towns composing the mutual aid system. Mutual aid is one of the major factors in preventing serious fires from developing into conflagrations and it is of great interest to observe that such a practice has remained unchanged in principle throughout the years. Mr. Baker continues; "This public recognition and the hope of future glory, was possibly the immediate incentive for the Town of Brookline to vote in 1795 to assume one-half of the expenses after enjoying the protection of the engine and its company for eight years." Firewards were established by law in 1791 and it was the duty of these officers to attend fires, "vigorously exert themselves to extinguish and prevent the spreading of fire, and for the pulling down or the blowing up of any house, or any other services relating thereto." The Firewards were used to assist in salvage of property and to guard the same from pilferage after the fire. These officers apparently had the power of arrest as one who disobeyed them was subject to a fine of 40s. The fire engine in use at that time (1787) was a hand tub which was filled with water by buckets and the water was forced by means of a lever operated piston pump, (the levers were termed "brakes") , through a nozzle attached to the body of the engine. Fire hose had not been developed for use in this area at that time. This machine was sold for $30.00 in 1828. The company that operated this engine was known as the "Vigilant" Fire Company. The town bought a new Thayer fire engine in 1828 for $400.00. Roxbury paid $150.00 of this sum and the machine was for the protection of both towns. This engine was named the " Norfolk", and was housed in a new engine house spanning the village brook off Washington Street where the railroad bridge is at present situated. The "Norfolk" differed from the "Vigilant" in that it had a hose connection from the pump and the water could be discharged by hoseline to the fire. Buckets were still needed to fill the reservoir of the " Norfolk" , which was similar in this respect to the "Vigilant". However one can surmise the flexibility of applying water on a fire from a hose as compared to a fixed device mounted on an engine which could not be easily maneuvered around a burning building. The "Norfolk" was also identified during this period as Engine #7 of the Roxbury Department. The sum of $50.00 was spent by the town for the purpose of purchasing water buckets for the "Norfolk" in April, 1829. 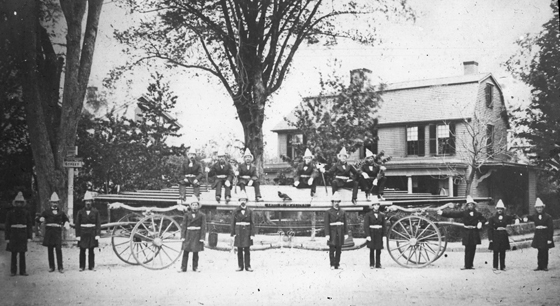 A hook and ladder was purchased in 1832 from the town of Roxbury for the sum of $230.00 and this apparatus was placed in service at the engine house with the "Norfolk". The firehouse was the social center for the volunteers and many functions were associated with it including, chowder parties, parades, musters, and no doubt, political affairs. The men requested the Selectmen of the town, in 1834, to furnish the company with a kettle, but the request was turned down and the company disbanded only to be replaced by others eager and willing to enjoy the prestige of being a "Volunteer". A new suction type engine was purchased in 1839 for $900.00 by the town. This Engine could draft water from a well or pond and then discharge it through a hose upon a fire. The engine was named "Brookline #1" and was manned by a new group of young men who had difficulty in choosing a commanding officer and for some period of time there was no organized company. Apparently, some severe dissension existed as is evidenced by the fact that in the autumn of 1843 someone immobilized the engine in the firehouse so that it could not be easily moved and then set the firehouse afire, resulting in severe damage to the apparatus. However, the burned and "blackened" engine answered an alarm to a serious fire in Church Street, Boston, and gave good service, before it could be repaired completely. A new firehouse was built six months later at a cost of nearly $3,000 and another volunteer group organized. . Fires were announced by ringing the church bell of the Baptist Church, when the church was not in session. The Baptist Deacons refused to allow the bell to sound alarms during services or for out-of-town fires which they possibly believed were too distant for the Brookline Volunteers to be of much practical assistance. The steeple was felled in a gale in 1897 and the bell was broken and was later recast. On the evening of September 2, 1844, a public meeting was held in the new firehouse on Washington Street, and a petition for "suitable encouragement" was requested from the Selectmen by the newly organized fire company who agreed to protect the town from fire. Thirty-nine members signed the petition and referred to themselves as the "Bone and Muscle of Brookline". Few fires of importance occurred during the next few years and the fire company was mainly interested in "Chowder Parties" and similar events. Harmony between the "laddies" and the Selectmen prevailed until 1847 when the question of temperance arose. After extinguishing or attending a fire, it appears to have been customary for the "Fire Laddies" to seek refreshment after their labor by imbibing a liquid, carried in a bucket and smelling very strong of an odor similar to brandy. The men had the temerity to forward a bill of $13.75 for this refreshment to the Selectmen, who refused to pay it. This unappreciative attitude on the part of the Town Fathers caused the members of the fire company to lose enthusiasm for their work and the company disbanded. History records that the Selectmen rose to the occasion and soon recruited a new group of firemen. The town experienced two serious fires in 1848 whereby the need for a more ample and better-distributed water supply was realized and this resulted in the installation of hydrants along Boylston Street and in the Village. These hydrants were connected to the 40-inch diameter main which carried the Boston water supply from Lake Cochituate along Boylston Street to Boston. The first mention of the successful conviction of an arsonist recorded that the town was plagued by an outbreak of barn and other outbuilding fires and that the constables set up a watch for the offender and caught one Thaxter Prouty, who was tried and convicted for his crimes, in 1852. During the year 1855, the Catholic Church in Amden Place was burned. On Thanksgiving Day, November 27th, the Church of "St. Mary" suffered a disastrous fire. History records that during this fire, some miscreant cut the leading hose twice. The church was repaired and enlarged afterward. The Church was built in 1854 and the Reverend Mr. O'Bierne was the first priest of the parish and was succeeded by Reverend J. M. Finotti in 1856. The growing need for a better distributed water supply for fire protection resulted in the town voting $2,400 for reservoirs at Walnut and High Streets and at Beacon and Carlton Streets in 1869. 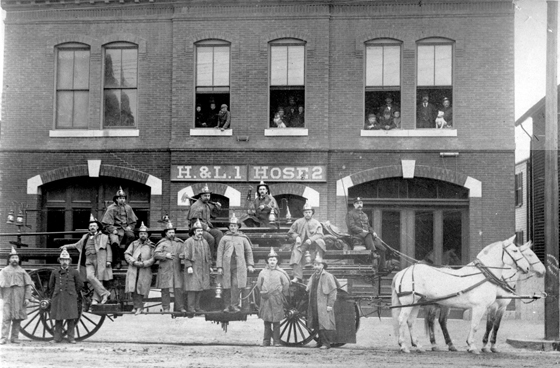 The George H. Stone Hook and Ladder Company was the first regularly organized ladder company placed in service in February, 1871. George H. Stone had been a popular and efficient member of the fire force and had served in the Civil War. During this time, the town purchased a new ladder truck for $1,200. The Good Intent Hose Company was organized in 1865 and was quartered with the ladder company in the Village. The year 1870 saw the firewards bow out of the scene and a board of fire engineers took command. That year the townspeople voted the sum of $14,000 to build a brick and granite trimmed firehouse for the steamer and hose carriage. This building was situated in the Village on the site of the present Station # 1. Brookline Village, Lower Washington St.
A red brick three-story fire station was built on Washington Street at Thayer Street in 1873 and the first steam fire engine was purchased at a cost of $6950. The year 1882 recorded that the fire department appropriation included money to purchase a new chemical and hose wagon and a new firehouse for the Longwood section. 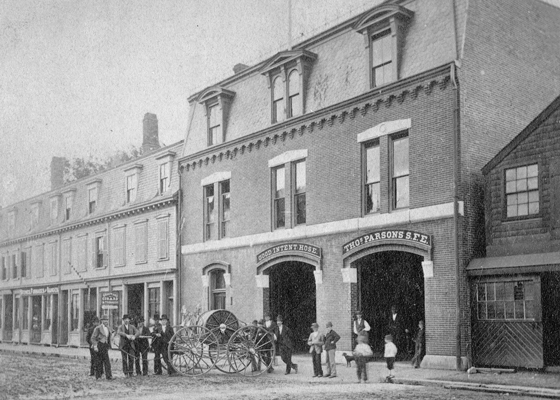 The building is situated on Monmouth Street at St. Mary's Street; it is at present, quarters for Engine Company #3. Fire station # 5 on Devotion Street was built in 1893 and station 7 on Washington Street near Beacon Street was erected in 1899. Station 4 on Boylston Street at Reservoir Road was built in 1930, replacing the old wooden fire house situated across the street at what was then called Pound Lane. In 1939 a new modern building and training facility was opened on Hammond Street near Horace James Circle, replacing an obsolete building at Heath Street. 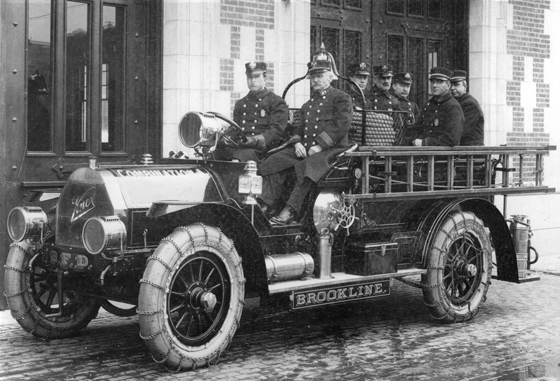 Brookline voted to have installed in 1887 a new fire alarm telegraph system. The system had been under discussion for some time prior to its approval. Superintendent of lights and wires, Mr. Eugene Davis, designed the layout of the system and supervised its installation and then maintained it for many years. An improved fire department was reorganized in 1889, consisting of 27 permanent men and 50 call men under the administration of Mr. B. W. Neale Jr.; as the town increased in growth, the department by 1904 had developed into an organization of 42 paid officers and men manning 12 pieces of apparatus which were housed in 7 fire stations. The financial cost of operation for that year was $70,000. The first piece of motorized apparatus was a 1909 Knox chemical and hose wagon, built in Springfield, Massachusetts, and designated "Combination A". This piece of equipment was housed in Station 1 in the Village for many years where it answered all alarms and immediately proved its efficiency over the horse-drawn wagons in responding on long runs to distant parts of the town. 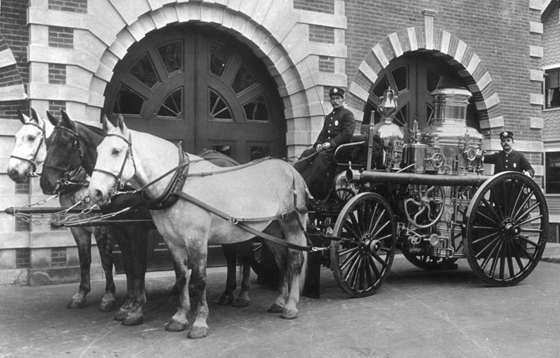 Thus, the days of the faithful fire horse were doomed to end and by 1923 the only memory of them was in the reminiscences of the "Old Timers" and in the odor the horses left behind which lingered in the stations for years to come. The operations of the department in a typical year, 1959, involved an operating expenditure of $1,304,358. The department answered 1,372 alarms of which 131 were to Boston and Newton and 109 were for resuscitation cases. There were 4 two-alarm fires in the town that year. The department made 9,277 fire prevention inspections. The fire loss that year was $301,000. George H. Johnson was appointed as the first permanent Fire Chief of the department and served from 1889 until 1923 when he was succeeded by Selden R. Allen who served from 1923 until 1946. Chief Thomas F. J. Malloy served from 1946 until 1953 and Chief George L. Gettings has held this office since 1953. During the twentieth century there have been several important fires in Brookline. The Holtzer-Cabot Electric Company factory, situated on Station Street near Washington Street, burned in 1911. On April 26, 1918, an alarm of fire was struck at 1:04 A.M. from box 316 for a fire in a bakery located at 250 Winchester Street. A second alarm was sounded at 1:13 A.M. The bakery was owned by Walter S. Blewett. Five bakers lost their lives in this fire, when, it is reported, they reentered the burning building to retrieve their valuables after having safely evacuated the building originally. 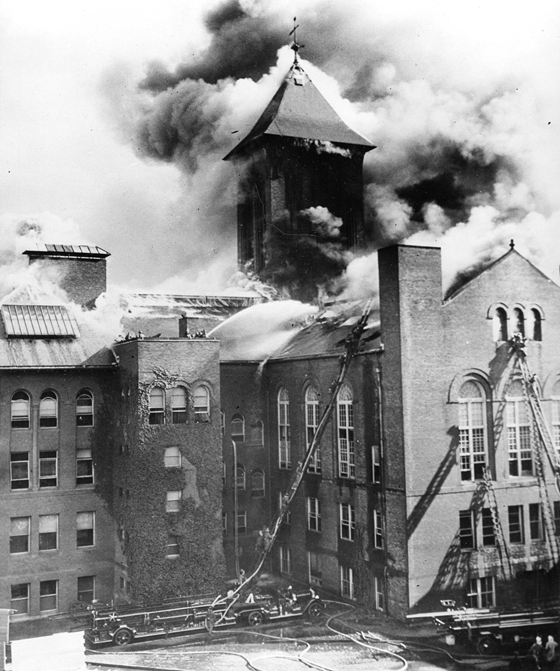 The Harvard Church burned on Tuesday, October 20, 1931, in a three-alarm fire that destroyed the interior of the church. The first alarm was sounded at 5: 17 P.M., and the fire was brought under control within two hours. The Brookline High School burned in a most spectacular fire early in the afternoon of Friday, September 25, 1936. The fire was discovered in the attic area above Shailer Hall at 2:27 P.M. and it swept through the whole roof area and spread up into the 165 foot high tower. The tower roof burned out of control of fire hose streams due to its height. Many fire departments sent apparatus to the scene. The battle against the flames continued until late in the night before it was subdued by 150 firefighters from Boston, Brookline and Newton. The school was built in 1895 and the loss was estimated at the time at about $350,000. The Saturday editions of many of the nation's leading newspapers, including those in New York City, carried front page stories and aerial photographs of the school being destroyed by fire. 15 firefighters were hospitalized for injuries and smoke inhalation. Another fire of historical interest, which occurred on Friday, April 26, 1946, destroyed the old apartment hotel known as Brandon Hall, situated on Beacon Street nearly opposite Lancaster Terrace. This fire was discovered at 4:45 A.M. and a second alarm was sounded at 4:54 A.M., followed by a third alarm at 5:00 A.M. The building had been used during World War II as a dormitory for the SPARS, a female sub-division of the U. S. Coast Guard. This fire roared through the building with an unusual speed and the water poured on it from 12 pumping engines failed to impede its progress. The building was five stories high in the rear, abutting on Griggs road and three stories high at the front facing Beacon Street. The building was totally gutted and was torn down shortly thereafter. New Year's Eve, 1961, will be remembered by many people in Brookline, when fire broke out in the First Presbyterian Church on Harvard Street shortly after midnight and destroyed a prominent landmark erected in 1858. This fire quickly spread to the steeple and flames reached about 130 feet high as the church was consumed by fire in three hours. This fire was witnessed by thousands of greater Boston people celebrating the New Year and a general feeling of sadness prevailed as they saw this lovely old church disintegrate in flames and pass into history to become but a memory to this generation. Time will not permit the detailed mention of many other fires that have happened and time will yet unveil for many other people to view other fires that will be recorded in the records of the town. Most of these fires can be prevented by proper building construction, automatic fire protection devices and an educational program of fire safety. Modern building and fire prevention codes will eventually eliminate the ignorance, the indifference and the selfishness which are primarily the chief causes of the creation of fire hazards in buildings. We live in a rapidly changing world which has given to us the automobile, the airplane, the threat of nuclear war, the crowded apartment houses and the traffic-jammed streets. Each of these advances in science places a great responsibility upon the fire department. The parking of automobiles creates a tremendous problem by delaying the quick response of fire apparatus to alarms of fire and other emergencies and also hinders the operation of the men and the apparatus at the scene of a fire. Almost every building is heated by fuel oil. The deliveries of this oil to each building that uses it requires frequent tank truck appearances upon our streets. The many gasoline service stations are supplied by tank trucks which also travel upon our streets. Interstate transportation upon Boylston Street brings many flammable and explosive cargoes. Therefore, the potential fire hazard of today is very severe as compared to that of one hundred years ago, despite the improvement ·of modern fire-fighting apparatus. Brookline's Fire Department today is housed in seven fire stations and employs a total of 204 people. The Department is divided into the firefighting force, the division of fire prevention, the fire alarm office, the administration offices, the maintenance shop, the training school and the wire division. The Department operates 7 pumping engines in active service and 2 in reserve, 3, aerial ladder trucks and 1 in reserve, 1 lighting plant and 1 rescue boat. There are 238 public fire alarm signal boxes distributed throughout the town; 1,432 fire hydrants give an ample supply of water satisfying the rigid requirements of the National Board of Fire Underwriters. All stations and apparatus are equipped with 2-way radios for rapid communication under all circumstances. Should a person "pull the hook" on a Brookline fire alarm box, this action will cause 3 pumpers, 2 aerial ladder trucks, 1 Deputy Chief and the Chief of Department to respond to the location of the fire alarm box that was actuated. During the hours of darkness, a lighting truck will also respond. Should the fire be serious enough to warrant additional men and apparatus, a "second" alarm is sounded by the Chief Officer and 2 more pumpers and 1 ladder truck will respond to the scene. A "third" alarm will bring 2 more Brookline pumpers which are also termed "engine companies". Meanwhile, the mutual aid system automatically goes into effect when the "second" alarm is sounded, which brings a Boston ladder company into Brookline to "cover" or fill in at a Brookline station for any other fire that may occur. When the "third" alarm is sounded, a Boston engine will report directly to the fire and 2 other Boston engines and 1 Newton engine will fill in at Brookline stations. A "fourth" alarm brings 2 additional out of town or mutual aid engine companies to the fire which were "covering" or filling in at the Brookline stations, and other companies from Boston would replace them at the stations in Brookline. Special calls can be initiated to bring more apparatus from out of town if necessary. Therefore, it is possible, under normal peacetime conditions, to obtain out-of-town assistance when the local department is confronted with serious fire emergencies. Our modern firefighter is required to know more than his predecessor because of scientific advancements in the use of electricity for domestic home appliances, the widespread use of flammable liquids and chemicals, modern development of fire equipment and rescue tools. His basic knowledge of first aid and his highly specialized techniques of resuscitation and rescue breathing truly qualify your firefighter as a practicing humanitarian. Since this talk was given in 1961, the department has been given a course on radiation monitoring and all stations have been equipped with radiation monitoring meters for use in accidents involving nuclear materials and for wartime survival purposes. The fire force has been trained in the use of rescue breathing and external heart compression for cardiac emergencies by Dr. Charles Weingarten in a program sponsored by the Massachusetts Heart Association. The town voted to expend $300,000 for a new fire station to be located on Babcock Street, March 27, 1963. The new house will replace the Devotion and Monmouth Street fire stations.